There are 12 reviews of Baume Du Doge. I agree with previous posters that the opening is stunning and the dry down less so, but for me it is definitely NOT disappointing. Despite this, I still believe overall that Baume du Doge is an very good fragrance. A little more projection and I would classify it as EXCECCENT. Imagine the kind of dry, austere, smoky incense-and-cardamom accord that Bertrand Duchaufour presents in Dzongkha laid over a rich, bittersweet vanilla gourmand base, and you might come up with something like Baume du Doge. The juxtaposition of sweet and dry, stony and edible is novel to the point of shocking, though in an gratifying manner. Within a few minutes of application, a minty/camphoraceous note wells up from the gourmand base, and somehow manages to stitch the two opposing olfactory blocks together. (Since there is nothing even remotely minty listed in Baume du Doge’s pyramid, I attribute my impression to an odd synergy between the herbal fennel and the crisp quality of clove.) At this point in the development I’m reminded of Lorenzo Villoresi’s Piper Nigrum, which also uses mint in a sweet oriental context, but Baume du Doge displays a smoother and more fully integrated structure. Where the opening of Piper Nigrum can come off as jangling or cacophonous, this new scent is suave and articulate. 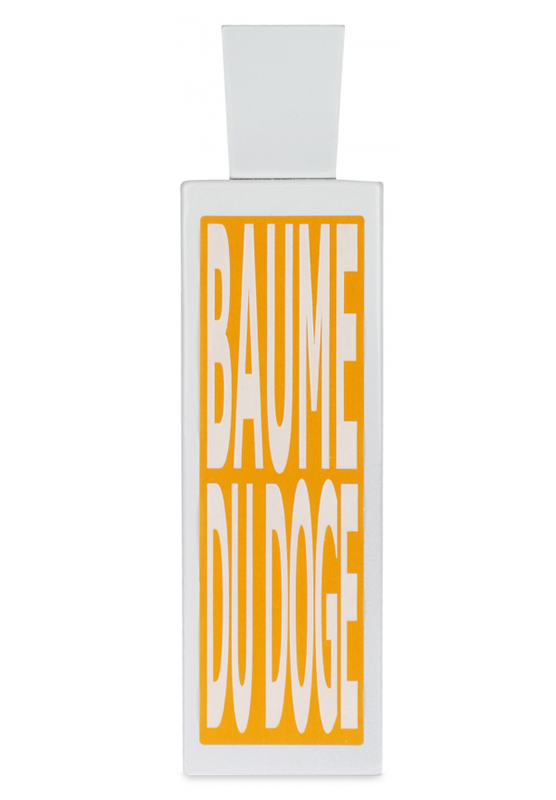 Baume du Doge also dries down crisp, woody, and slightly sweet, which is a far cry from Piper Nigrum’s powdery vanillic-amber exit. It is tenacious, with moderate sillage and projection, and it strikes me as relatively gender neutral – leaning perhaps slightly toward the masculine. To the best of my knowledge, Baume du Doge is Duchaufour’s first gourmand woody oriental since he did Méchant Loup for L’Artisan Perfumeur. I may be in a minority of one in finding Duchaufour’s recent excursion into peppery aquatic florals in the guise of Magnolia Romana more interesting than Baume du Doge, but I can heartily recommend this new scent to anyone who enjoys a spicy oriental. Excellent beginning and far less thrilling dry down. The first blast is stunning, simply stunning on my skin. I detect immediately a sort of inebriating (almost boozy and sparkling in effect) powdery/peppery orange-cinnamon combo which is aromatic, by soon almost minty and i would say dusty in a sort of barely talky/cedary and spicy way. A huge amount of pungent molecules swirl in the air. The orange is soon detectable in this phase but is fortunately a bit veiled by aromatic elements and spices, which is frankly a detail i appreciate. You can detect also a sort of green cedar/myrrh association which is dusty for sure (with the support of some peppery notes) and soon powdery (and in a while almost balmy) but in a slightly humid way. The note of fennel imprints that minty touch in its combination with some aromatic spices as coriander and saffron. The background is anyway dominated by a spicy sweet orange with a cedary woody approach (and a longly peppery vibe). Effectively the more the development goes ahead the more some balsams and the slightly sticky frankincense take the stage taming (hardly) the spices tornado and orienting the juice towards a more ordinary "supremely orangy" vanilla and incense basic mixture. I appreciate this juice despite i don't properly crave for the scents with a dominant spicy orange, anyway i can't write this is something i would suppose ever to purchase. The dry down retains a sort of earthy/incensey undertone but the main olfactory (balmy/gassy) appearance is frankly a bit boring, "designer type", fashionable and common, lacking that touch of atmospherical and evocative holiness that a niche incense fragrance is used to imprint aroud. Pros: Spicy, aromatic, slightly incensey. Cons: Too much finally orangy/vanillic." Opens with a very strong mix of orange and spices, immediately followed by a strong cedar note. The cedar eventually takes over on me and becomes the dominant note throughout the fragrance. I don’t get much of the basenotes – I don’t get vanilla or benzoin or anything. Sillage is great and longevity is also very good. I can see the Christmas connection, although I probably wouldn’t have made that connection without someone already pointing that out to me. It does smell a bit like pencil shavings and is quite dry. The cedar note is very strong, but is quite pleasant. Don't get me wrong, BDD smells good but if compared to other Duchaufour's woody-incensey compositions in the same vein such as Jubilation XXV or Dzongkha, it fails to coalesce into an outstanding fragrance. this starts quite promising actually, a blast of resinous, exotic spices, quite sweet but also incensy, unfortunately after half an hour you are left with only.... oh, no: toothpaste. yes, a minty, fresh toothpaste. i will have to pass i'm afraid. There are no member images of Baume Du Doge yet. Why not be the first?